Garage doors can make up a large portion of the exterior of a property. It is therefore important that they look smart and give a good first impression. 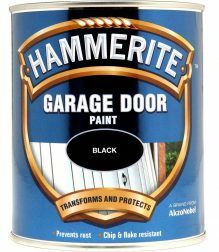 When garage doors need smartening up, turn to Hammerite Garage Door Paint for the perfect solution. Follow the guide below for the best results. Prepare the garage door by rubbing down with either coarse sandpaper or a wire brush. Wash the door with water and a diluted detergent. This will remove any dust, grease or dirt which may prevent the paint from sticking to the surface. Ensure the door is completely dry again before painting. When painting outside, try to ensure the temperature is between 8 and 25°C for optimum paint performance. Before you paint your garage doors, ensure that the ground and surrounding area are protected with a dust sheet or newspaper to catch any spills or drips. Begin by opening the garage door and painting the edges which are not visible when it is shut. Once the edges are dry, close the door and begin painting at the top of the door. A step ladder may be required for this. Work your way down in stages until the whole door is painted. Always apply one thin coat to begin with, followed by a second one if necessary. Leave to dry for the time specified on the back of the tin before over-coating. 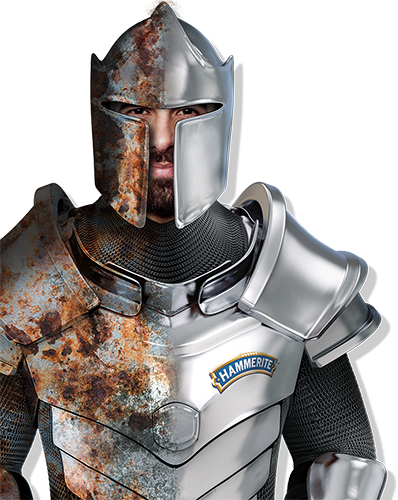 How do I paint Hammerite onto a painted surface? Paint a small test patch of Hammerite Paint onto the painted surface and leave it to dry for an hour. 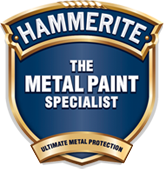 If you notice any defects to the painted surface under the test patch, remove all the paint from surface with paint remover, before painting the surface with Hammerite Paint.